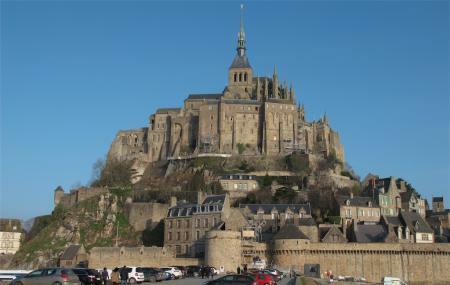 The Mont Saint Michel is perched upon a small rocky island with stout ramparts and battlements surrounding it. Popular for its extreme tides, during high tides the attraction is entirely encompassed by sea while during low tides bare sand surrounds the manor. Mont Saint Michel exhibits parts that belong to the 15th and 19th century relevant to the Bay of the Mont-Saint-Michel. The center houses exhibitions along with guided walks and other activities. Timings to visit Mont Saint Michel solely depend on the tides. Guided tours are available to Mont Saint Michel. You can hire a bus to Mont Saint Michel. How popular is Mont Saint Michel? People normally club together La Poste and La Grande Rue while planning their visit to Mont Saint Michel. Amazing day out. Great free shuttle from the car park. Bit of a wait for it both there and back but definitely worth it. Buy tickets to visit the Abbey online before visiting as it’s only ten euros per adult and under 18’s are free. You can then go in through the ‘groups’ section on the stairs rather than waiting in the Queue with everyone else. Brilliant day out! One of our absolute favorite destinations of from three years of European travel. The old world feel in the outdoor areas was so consistent throughout that it felt like time travel or walking into a fairytale. It's definitely a popular stop though, so be ready to share it with a crowd. This is an incredible place.... A must see! But don't be like me and bring lunch with you because anything there is so so overpriced and pretty gross.... quite frankly I felt it gave me a negative impression of the whole place! Nonetheless it was incredible and would go again just to sit at look at it from the sand! Amazing experience that I will never forget. I was lucky enough to time my visit with one of the two free English speaking tours of the Abbey for the day. Our guide was brilliant and had lots of information to provide about the history of the place. Unfortunately there were not very many vegan options for food at Mont Saint-Michel so I ended up with chips again for lunch. If I return I would love to leave more time to do the crossing of the bay with one of the experienced guides.